A female firefighter, despite being severely wounded and bleeding from the face, proved the triumphant heroine in a nine-vehicle collision which occurred at the intersection of Market and King Streets in Montego Bay, St. James yesterday, August 7, 2018. Bystanders, a pregnant woman and her husband, as well as an unsuspecting taxi operator, all narrowly escaped death, thanks to the heroics of the wounded firewoman, who was also the driver of the firetruck. By all reports, the miraculous outcome of zero deaths in such a mass collision is all thanks to her. According to eyewitnesses, the series of events which resulted in the nine-vehicle collision all seem reminiscent of a scene from a Hollywood thriller. Reports reaching this newsroom are that the firetruck, which operates from the Ironshore station, was travelling along Market Street, en route to the scene of an incident of fire at Barracks Road some minutes after 2 p.m., when disaster struck. On reaching the intersection of King and Market Streets, the firetruck, moving with its usual urgency, was forced to come to a sudden halt, after recognizing that contact was imminent with a moving Mini Cooper, which eyewitnesses say was also utilizing the roadway. The impact of that collision, it was revealed, sent the firetruck swerving. That collision was the first domino to fall in that line of collisions. Skidding along on two wheels, according to additional eyewitness reports, the firetruck then slammed into a Toyota Wish, then into a Suzuki SX4, before coming to a final stop in the side of a Toyota Corolla, while also breaking two utility poles. The other vehicles affected by the domino effect of the high impact collisions included a Nissan AD Wagon, a Toyota Probox, a Honda Civic and a Toyota Fielder. 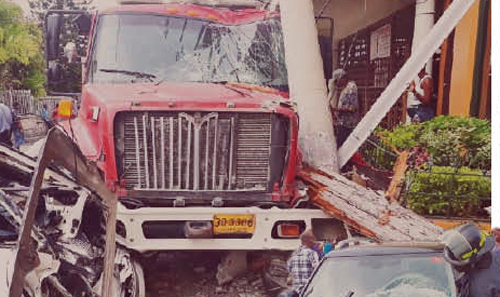 Though tragedy was averted for all, none involved in the crash seemed more grateful than Robert McKenzie, the taxi operator who was sitting in his Toyota Wish, frozen with his hot soup in hand, watching as the firetruck came careening towards him. That he left that incident alive, McKenzie is counting his blessings, choosing to believe that God spared his life from certain death. According to the shaken McKenzie, he was sitting in his car drinking some soup, which he barely realized spilled on him, as he watched the female driver of the fire unit pull of an amazing evasive driving maneuver, which ultimately spared his life. Speaking to this newsroom, and seeming to care little about the damage his car sustained, McKenzie had nothing but praises for the firewoman, whom he described as a good driver. Though the firewoman managed to prevent serious harm to the civilians trapped in harm’s way, she was not so lucky, as during her maneuvers, she sustained a deep cut to the face, which onlookers reported caused major bleeding for the servicewoman. She, along with the other firefighters in tow, appeared undaunted, as as soon as the truck came to a complete halt, they sprang into action, rushing to help those who were trapped in their vehicles. It is reported that while bleeding, the firewoman rushed to the Mini Cooper in a bid to safely remove the pregnant woman from the severely damaged vehicle, followed by the removal of her husband, who managed to get out of the car with a little help from the servicemen. In the aftermath of the collisions, the firewoman, along with the other firefighters, was taken to the hospital to tend to the wound in the face, while the others were treated. The married couple was also taken to the hospital, but their injuries were not deemed to be as serious. According to the St. James Fire Department, all persons involved in the wide scale crash are doing well. The department also revealed that the fire unit involved in the crash suffered major damage, and may very well be permanently out of commission. The police are conducting investigations.